One of my friends recently asked me for help. She was volunteering for a face painting project and wanted to know how to sanitize brushes, faces, etc. As a makeup artist, I have to take great care to keep my tools and clients clean, so I was happy to help. We're doing face painting for a "creative altruism" exercise for my creativity class. Do you have any advice as to how we can sterilize either the brushes or the faces? We're doing this in a few days, so it'll need to be inexpensive and easy to obtain. 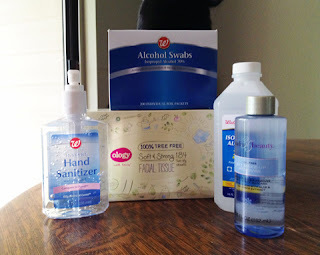 I recommend using alcohol wipes for the faces (or isopropyl/rubbing alcohol on a cotton ball or pad). For the brushes, if you use a slick "liquid" brush, soak it in an eye makeup remover (such as Beauty Without Cruelty or a similar version that helps remove oils) - this will clean it and remove traces of paint. Once the paint has been removed, the simplest thing for sanitizing is to dip it in alcohol between uses and dry on a clean tissue (or air dry) before painting again. And one common sense tip - remember to sanitize your hands between "clients." Hope you have a great face painting event! Disclosure notice: Products mentioned in this article may have been sent to me free of charge by the manufacturer for review. No additional compensation was accepted and the opinions are my own. Please verify any claims with the manufacturer, especially if you have any allergies or concerns.